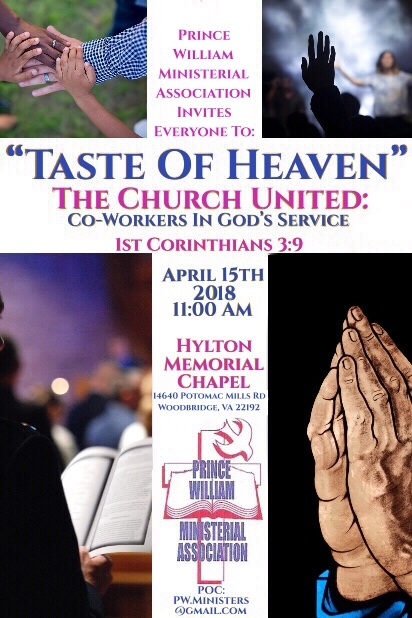 "A Taste of Heaven", a vision of the Prince William County Ministerial Association, conceived twenty years ago, gathers churches from across Prince William to worship together under one roof for one Sunday. It takes a venue like the Hylton Memorial Chapel to effectively host a gathering of this size. Its a morning of inspired worship, powerful praise, and challenging messages as a few thousand followers of the Christ come together in one heart and one spirit. Anglicans, Baptists, Charismatic, and Non-Denominational believers set aside their own distinctive liturgies as Christ is elevated, seeds of unity & reconciliation are sown, and friendships are made/reinforced. In some ways, it was reminiscent of Camp Meeting from back in the day, minus the heat, humidity, and mosquitoes. But best of all, it was two hours where the saints came together to desegregate the most segregated hour of the week in America. There was a great takeaway for those attending yesterday's gathering in that "Unity is not Uniformity". Our Devotion, our Worship, our unique traditions all aim to lift high the name of the Almighty. We are one body that can find its unity in its diversity. Its my hope and prayer that events like this would spread all across the commonwealth and our nation. Too, I'd pray that this "taste" would leave saints desiring more.